Infrared satellite view of tropical wave in the Caribbean, between Honduras and Cuba, on 19 October 2010. Heavy rains over southeastern Cuba and Grand Cayman are visible. 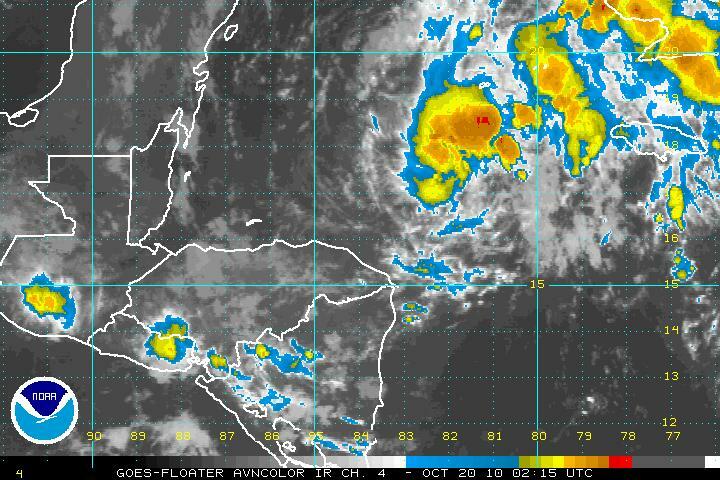 At 2215 EST on 19 October 2010 the tropical wave in the northwestern Caribbean appears to have grown stronger and better organized over the past few hours. Maximum sustained winds estimated on the basis of satellite observations are already near 35 mph. The environment surrounding this tropical wave appears favorable for further development as the system moves toward Cuba and Grand Cayman. It may become the next tropical storm of the 2010 Atlantic hurricane season within the next few hours. Satellite view for the aviation industry showing the tropical wave now active in the northwestern Caribbean on 19 October 2010 at 2215 EST. The bright reds and oranges show the areas of most intense rain. Rotation around a center of low pressure is already apparent in this view. The region from southern Mexico (Tehuantepec, the Bay of Campeche, Oaxaca, Chiapas) through Central America, to Panama and northern Colombia, including the eastern Pacific off the coast and all of the Caribbean have seen a particularly wet and stormy season in 2010. 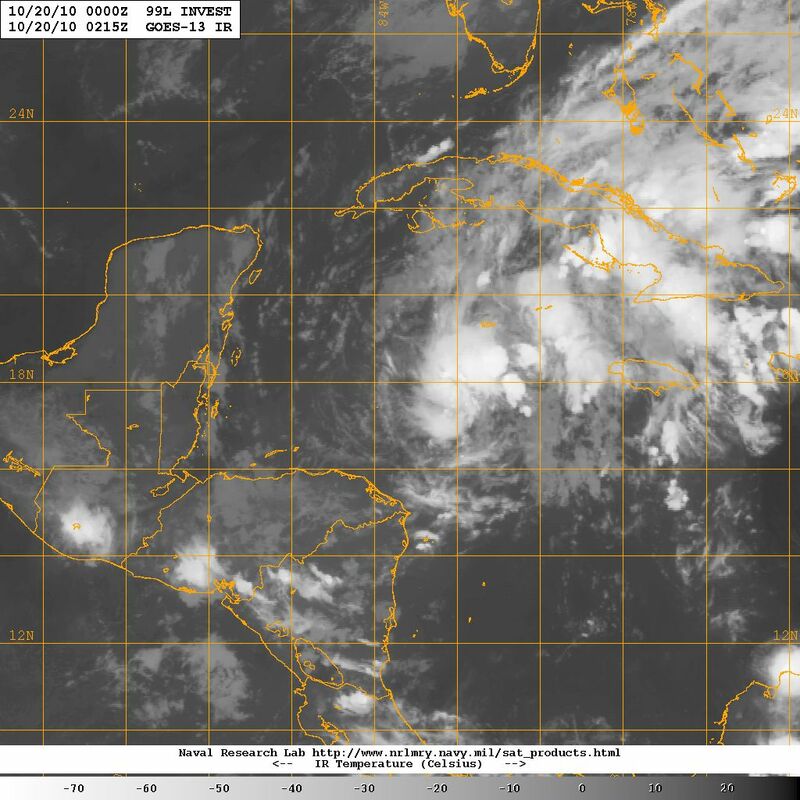 Numerous tropical waves and rain/storm cells have been generated both over the eastern Pacific and the Caribbean, which have led to tropical cyclone formation and episodes of rain and thunderstorms over most of Central America, but particularly Nicaragua and Costa Rica as well as other countries in the region, lasting several days at a time. 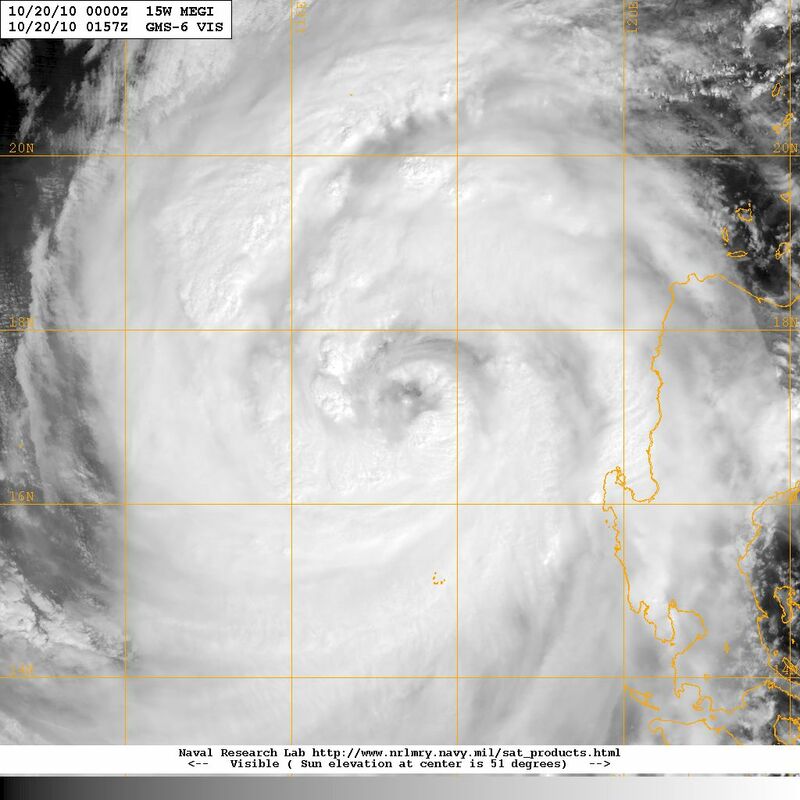 Satellite view of typhoon MEGI on 19 October 2010 at 2157 EST while it moves over the South China Sea with sustained winds in excess of 130 mph. Another region that has had quite a wet and stormy season is located at the opposite side of the globe, in the western Pacific, especially the triangular region from the Philippines, to Korea and Viet Nam, which has seen several tropical cyclones develop and make landfall so far this year. Currently Typhoon MEGI, which was a category 5 cyclone just 48 hours ago is moving slowly toward the north by northwest over the South China Sea as a strong category 3 storm, with possibilities for further strengthening, aiming for the China mainland somewhere near Hong Kong. This typhoon made landfall in Luzon, the Philippines, as a category 5 tropical cyclone and lost strength as it traversed the island, but has grown stronger after having emerged over the warm waters of the South China Sea. Conditions appear favorable for further strengthening, perhaps even to category 4 strength in the next 12 – 24 hours. The track which just 24 hours ago aimed toward the west by southwest has gradually shifted to its present course of north by northwest, as shown in the view below prepared by the Navy Research Laboratory based on data and observations from NOAA. Projected track for typhoon MEGI on 19 October 2010 at 200 EST based on analysis of NOAA data and observations by the U.S. Navy Rsearch Laboratory.